The last two lessons at college have been on life drawing. I was quite nervous about doing this at first but once we got going it really was ok. My tutor was very good and referred to the model as ‘the figure’ for most of the lessons which made it easier and less embarrassing. 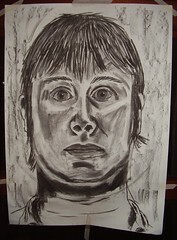 Last week we did charcoal sketches and the emphasis was on getting the essence of the figure within the picture. We focussed on tone and using texture/line to show the shape of the body. This week the emphasis was on proportion so we used pencil and spent a lot of time measuring size and angles. Both were quite hard work, especially as it’s very obvious to the human eye when you have drawn a figure wrongly but it takes a bit of thinking to figure out why they drawing isn’t working. I measured some angles wrongly at first this week and the model ended up with very wide and short legs, when I realised I had done this I was able to fix it but it took a little while to get there. There hasn’t been much knitting this week unfortunately. Work has been very manic so I’ve not felt like doing much when I get home in the evening. I have made some progress with the Autumn scarf but only a few rows really, it’s now 50% completed. Last week I finished the Clapotis for mum and she’s really pleased with it. I love the Noro long colour changes and it was fine to knit with but it feels really rough to me. I’d love to knit my own Clapotis but I need to find a non-itchy yarn with lovely colours that I can use. We only had one skein of the Noro (420m) so I did 5 increase repeats (83sts wide) and 18 repeats of the straight section which almost used up the entire ball so I think I used about 400m for the whole scarf. The pattern is really nice to knit, it requires a slight amount of concentration but not enough so that you can’t watch tv at the same time. It’s been very cold in the UK this week so I’ve been using my hot water bottle but as Jane says I’d like to knit a cover for it. So I think I’m going to attempt the same pattern she did but I will probably leave the cables in as I’ve never knitted cables before so it will be a good first cabling project. Well it’s almost over, back to work on Monday. I’ve done exactly what I wanted – indulged my crafts and creative self. I’ve knitted half a clapotis out of Noro Kureyon sock yarn – Mum bought the yarn for herself but didn’t get on with it very well so I am knitting it for her. I don’t love the yarn either, especially as it’s 100% wool which I find quite rough but I LOVE the colours. It really is beautifully dyed. I’ve done one less increase repeat so it’s slightly narrower than the pattern and I’m halfway through the ball of yarn at 12 repeats of the straight section. I cast on my autumnal scarf at the weekend and then knit on the train to London and back on Wednesday. I really enjoy knitting on the train as it always prompts a conversation with whomever is sat next to me. It was a nice old man on his way to a meeting in London this time, he said seeing me knitting reminded him of his mum. We ended up talking all the way to Waterloo about loads of different things – the war, engraving, cross stitch, the olympics are just a few of the subjects. And I very much doubt we would have talked at all if I’d just been reading. Anyway the scarf is now this long…. …and I’ve made one of the colour changes so it’s about 20% completed. It’s not the most interesting knit in the world and I have been doing more work on the clapotis this week but that’s because it’s fascinating watching the drop stitches unravel. But I still love the yarn and as you can see from the background, which is a photocopy of autumn leaves stuck to paper, it is definitely autumnal colours. This is the scarf I knitted for Bex. The colours are as bright as the picture but that is what she likes so I think she will like it. In London I did go to the National Gallery and the National Portrait Gallery and whilst I still don’t really like portraits still I can appreciate them now. 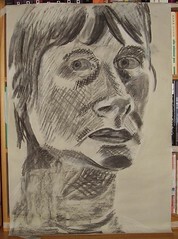 I did really like 4 chalk/charcoal sketches that I saw and so when we had to do another self portrait on Thursday evening using tone, I took my inspiration from the mark making I had seen on the sketches at the NPG. Here’s the result – it’s a little scary looking but it worked the way I hoped. If you squint at it you can see the tone does sort of work. I also did some painting, embroidery and listened to a lot of jazz. I really relaxed and chilled out – it was great!! I’ve finished the scarf for Bex on Monday but it’s not a 2×2 rib as that used up too much yarn. 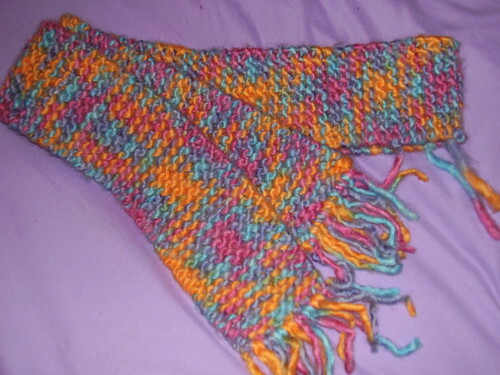 It’s a 10 stitch wide garter stitch scarf that is about 5 ft long and has a fringe on each end. I knitted on size 9mm needles and I think she will like it as it’s long enough to wrap round a couple of times to keep your neck really toasty!! 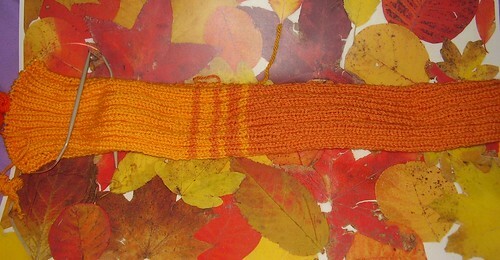 Last night I split the 3 balls of orange merino yarn into 6 balls and then cast on the Autumnal (Fall) inspired scarf. It’s got a moss stitch border and is a 2×3 rib on size 4mm needles. I’m going to London by train on Tuesday and it will be perfect to knit on the way. It’s my pre-Christmas annual trip to the big city. I go on my own and visit a musuem/gallery followed by some Christmas shopping. I’ve decided to go to the National Gallery and the National Portrait Gallery as they are both off Trafalgar Square, so easy to get to and educational for my sketching course as it’s more self portraits next week!! Then I will head up Charing Cross Road (via the commemorative plaque for no. 87!) and visit Foyles Bookshop, Borders (for craft magazines) , the Bead Shop on Tower Street and the large Paperchase on Tottenham Court Road to buy a diary for next year. I may go shopping on Oxford Street too as I need something to wear to the Christmas party. I’m off work this week so I’m hoping to get lots of crafty things done, scarf knitting, skirt sewing and lots of sketching I hope. I shall also drink lots of tea and sleep in! 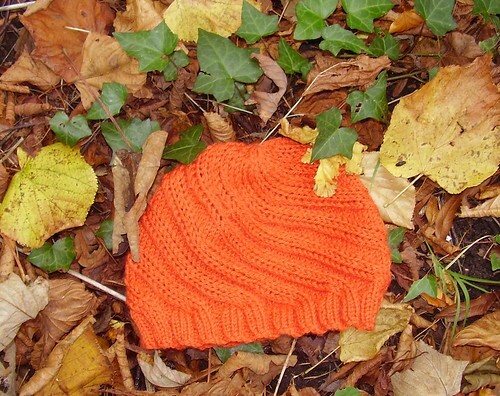 FO Odessa Hat and more knitting plans…. Here it is my finished Odessa Hat. It’s made from one 50g ball of Biggan Design First Cross Merino DK on 4mm needles. I bought the yarn at the Knitting And Stitching Show at Ally Pally. Biggan Design is an Australian company run by a swedish (I think) lady. They have produced this DK merino yarn in a rainbow of 64 colours which are all wonderful. It’s like looking at a set of felt tip pens or a wonderful paint chart. This hat is knitted in Burnt Orange and I’ve also got 1 ball each of Saffron, Pumpkin and Bright Orange which I will use to knit a ribbed scarf to go with the hat. I’ve been playing around with different ribs and have finally decided on the left hand end of this swatch. It will be a knit 3 purl 2 rib with a moss/seed stitch border that is 3 stitches wide to stop the scarf from curling. The right had end is a 1×1 rib and then a 2×2 rib and then I was playing with how I want to change from one colour to the next. But I’m not casting on until I’ve finished the odessa socks and I have about 30 rows to go on the second sock. 3. Knit 2×2 rib scarf for Bex for Christmas. 4. Knit lace something with 1200yds of blue laceweight yarn I got at Ally Pally. 5. Finish Wild Cherry Demeter – started in May 2008. 6. Finish blue Tofutsies lacy socks – started ages ago. 7. A black tank top. 8. Grey honeycomb tank top. 9. Crochet a cactus for a girl at work. I really shouldn’t make these flippant comments! 10. Knit Knucks for another colleague – zip my mouth shut someone!!! 11. Knit something with the 100yds of handspun I won from Erin. (see below). 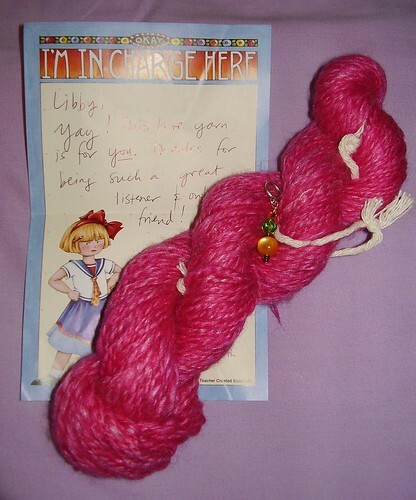 So many things to knit and so little time….